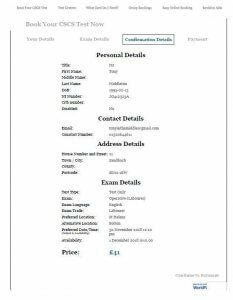 We’ve previously written here about the need to book your CSCS test direct with the examination centres online. DO NOT JUST “GOOGLE” CSCS TESTS – you will no doubt find at the top a load of “online booking” sites. These all charge a “booking fee” which is totally unnecessary and will make your test cost about £15 more than it should. I spent a few minutes “Mystery Shopping” one of these sites with equally mysterious details this afternoon to show you what I mean. £41.00 for a £21.00 test. It’s disgraceful. It’s little wonder people get frustrated with the CSCS scheme when people do this. ALSO – if you need the NVQ to be able to get a Blue CSCS Card – you will NOT have to take the CSCS test straight after you qualify – anyone with a new NVQ is EXEMPT from the CSCS Test for TWO Years. If you ever need FREE advice about cards or NVQ’s, go to SuperSkills.co.uk or call us on 01845 527445.